Back for its second year, the Perfect Pour by Warsteiner competition challenges bartenders across the United States to show off their technical skills and personal flair as they compete to present the most perfectly tapped glass of Warsteiner Premium German Pilsener for an all-expense paid trip to Germany. Entries will be accepted from May 30 through July 17. “A perfectly poured Warsteiner is more than just a glass of beer, it is a work of art to be admired,” said Laura Sprengard, brand manager for Warsteiner USA. Bartenders upload a photo of themselves with their perfectly poured Warsteiner (preferably poured into Warsteiner’s signature tulip glass) to PerfectPourOff.com. Photos can be serious or silly, but they must demonstrate mastery of Warsteiner’s four-step Perfect Pour ritual. To see how it’s done, watch the perfect pour here. Once bartenders have submitted their perfect pour, fans can vote online for their favorite through July 17. The three bartenders who receive the most votes, among other criteria, will be invited to compete in a live Perfect Pour-Off event in Las Vegas. The champion will win an all-expense paid, week-long trip for two to Germany. Each time a fan votes, they will be entered into the Perfect Pour Sweepstakes for a chance to win one of three all-expense paid trips for two to the Perfect Pour-Off event. Warsteiner Brewery, founded in 1753, is one of the largest private breweries in Germany. Its flagship is the Warsteiner Premium German Pilsener brand, one of the most popular beer brands in Germany and the world’s No. 1 imported premium pilsener among German private breweries. This is the perfect opportunity for bartenders to gain exposure. I have always admired their skill when it comes to presenting and creating drinks for people to enjoy! I can imagine these bartenders have plenty of experience to get that perfect pour. Bartenders have lots of talent. I would love a trip to Germany! I have friends that have tried to master the perfect pour. While it looks simple it can be a little difficult. Wow, there are really talented people out there! Bartending looks so hard, so keep it up guys and good luck on the competition! Some bartenders are super talented. This sounds like a fun competition. I’m not much of a beer drinker, so I really never knew the importance of a perfect pour. Thanks for the tips! I worked in a nightclub, pouring pints of Guinness for ravenous Paddy’s. Perfect pour? def not lol. I have seen a lot of talented bartenders, and a lot of them work in local eating establishments. I used to do bartending when I was younger and it was definitely not the job for me! I was terrible at pouring but always amazed when I see the perfect pour! It takes skills to pour the beer perfectly. I have a cousin who does this so well. I love watching some bartenders do their thing, They make it all look so easy and fun. Gunbatte to all the participants. I’m not a bartender but this looks like a fun challenge. I need to send this to my bartender friends. Maybe I can share this one with a bartender friend of mine. Although not from Germany, he might be interested in this one, I’m interested myself! I am not a bartender, but that looks like a fun challenge. I bet that’s going to go over well. What an amazing prize too! What a great competition for bartenders! Perfecting your pour can take a lot of time and skill! How cool is that! This sounds like a great opportunity for all bartenders. What a great contest. I’ve lived in Germany, and would love to visit again. I never knew there was such a thing as a perfect pour 🙂 I would be terrible at it! I envy bartenders, their moves are so perfect! This looks like a very enjoyable challenge to all bartenders! Do you need to buy anything in order to apply? Nope! 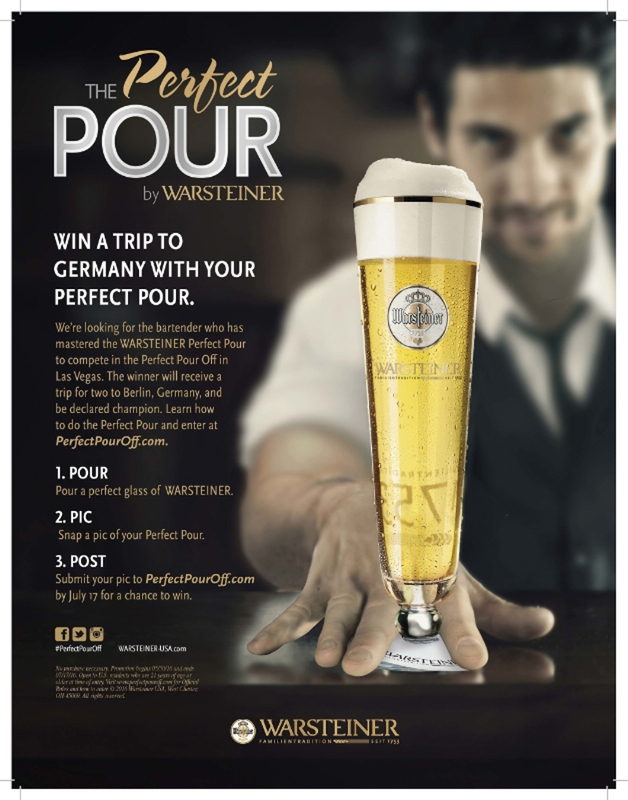 All you need to do to enter is snap a pic of you and your perfectly poured Warsteiner and submit it to PerfectPourOff.com before July 17. My husband and I are fascinated by Germany, from their cuisine, to their history, to their social and political structure. We’d love to visit one day. Good luck to all the entrants!